If you and I were having coffee right now … I would wish you a Merry Christmas and Happy New Year and ask you how you spent your holidays. 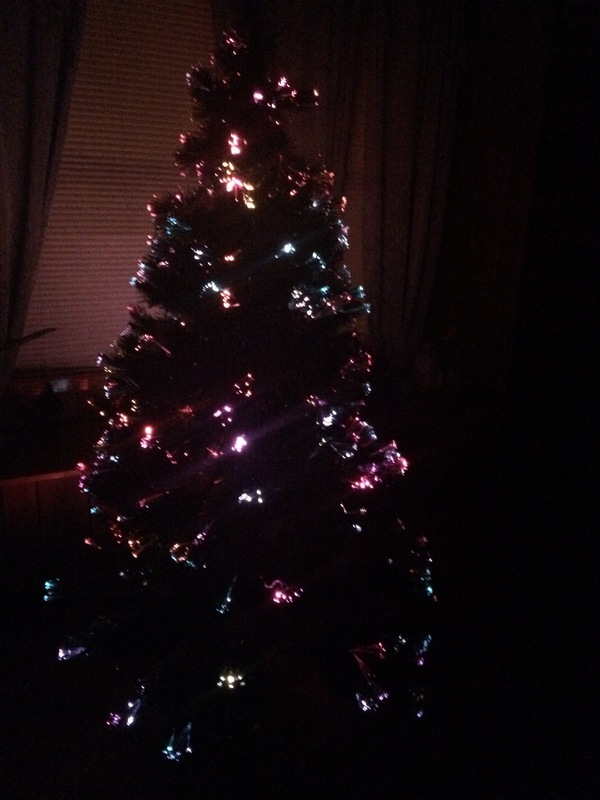 My Charlie Brown tree lit for the last time this Christmas on Little Christmas. If you and I were having coffee right now … I would thank you for joining me for coffee at my home on Little Christmas, The Feast of the Epiphany also known as Three Kings Day. Traditionally in many cultures, the day commemorating the visit and bringing of gifts to baby Jesus by the Three Kings is celebrated with the exchange of presents. Growing up Little Christmas always signified the close of the Christmas season. It was the last night that the lights of Christmas shined until the following Christmas. The day after Little Christmas, my mother would begin the task of putting away all the Christmas decorations. It is a tradition I follow as an adult and I always try to spend as much time at home on Little Christmas enjoying the lights and decorations before I begin dismantling my Christmas decorations. Some years this is a multi-day project, with the tree staying up particularly live trees until the weekend. But I, like my mother did, stop lighting the tree after Little Christmas. This year that process will be complete in a blink of an eye; one of the benefits post-Christmas of barely decorating. My living room at two o’clock in the afternoon Christmas Eve sans a Christmas tree. 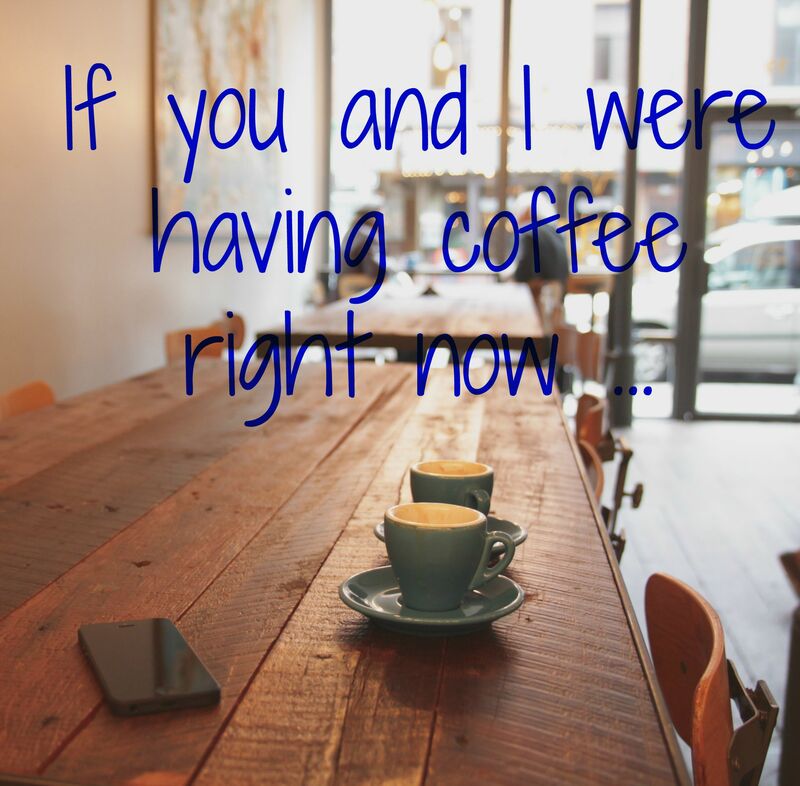 If you and I were having coffee right now … I would tell you how I made it sliding into Christmas Eve. My tree, which looks rather Charlie Brownish didn’t get put up until three hours before my family and friends were arriving on Christmas Eve. None of my other decorations made it up, but we had a tree to put presents under. There was plenty of food and laughter and the magic of Christmas permeated the house as my nieces and nephews squealed with delight over the stockings and presents Santa left them along the back stairwell leading to the second floor. Christmas Eve wasn’t a Martha event but measured by the smiles on the children’s faces it was a huge success. 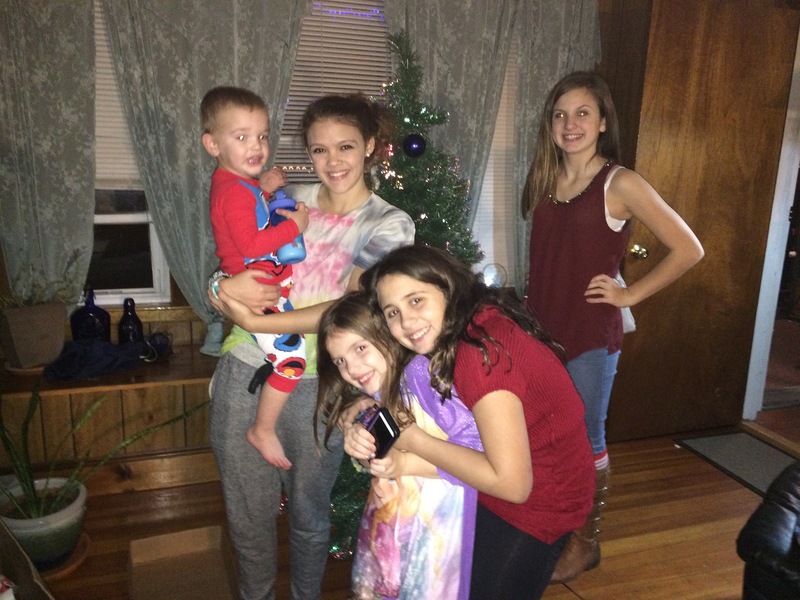 Some of my brat pack of nieces and nephew standing around my Charlie Brown tree on Christmas Eve. 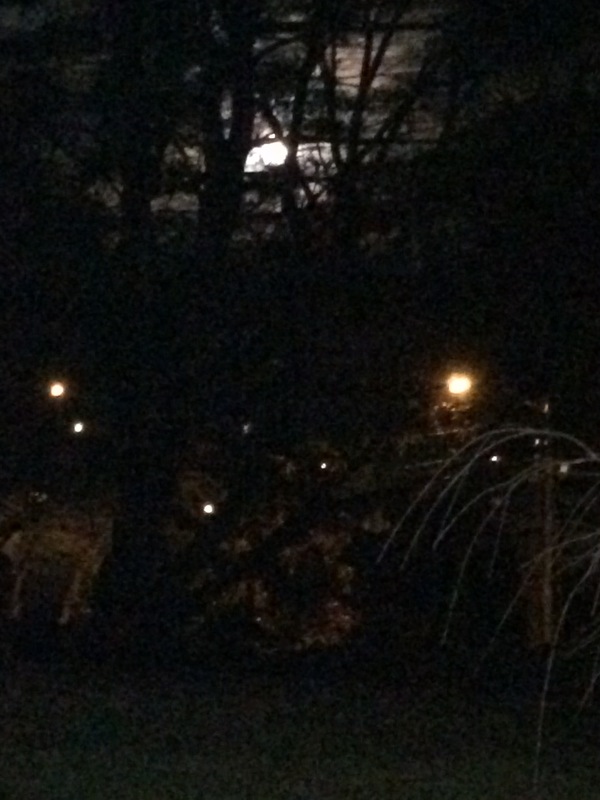 A full moon on Christmas night as seen from my sister’s front yard. If you and I were having coffee right now … I would tell you how unseasonably mild it had been in the Northeast during the days leading up to Christmas. This meant I was able to spend the entire day Christmas Day with my sister and her family. They have two cats I am highly allergic – the mild weather meant the windows were open and I could take breaks outside to breathe in the fresh air. 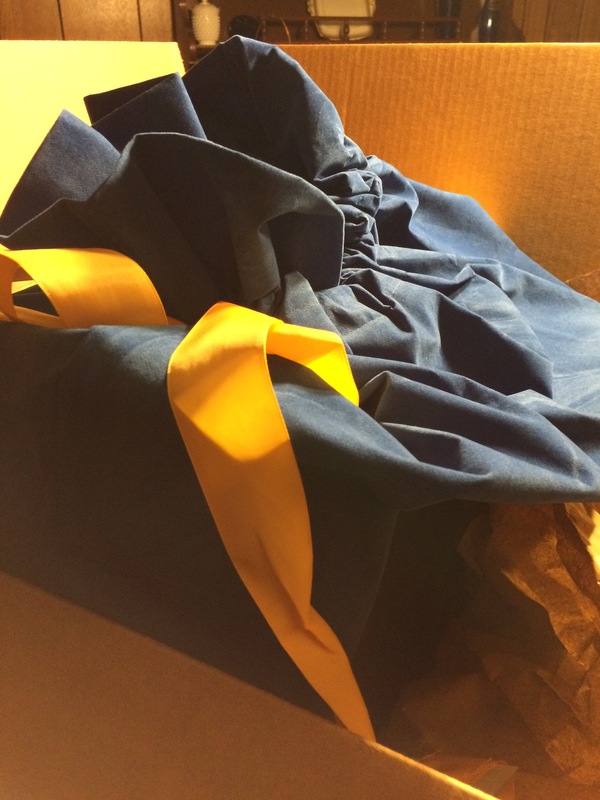 An Amazon blue and gold gift bag for me. If you and I were having coffee right now … I would tell you how I received the most generous present a couple of days before Christmas. A gift that brought me to tears. I kept saying to my mailman, but I didn’t order anything from Amazon. It never occurred to me that the box was a gift for me. I called my sister and asked her if she sent something to my house. 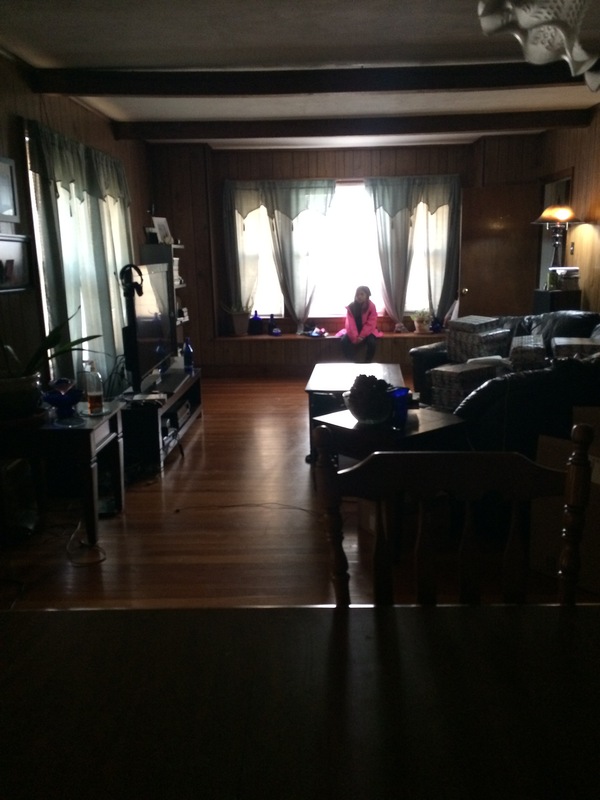 She was excited at the possibility that the hoverboard she bought my niece had arrived before Christmas – two hoverboards ordered at the same time and one arrived in time for Christmas and one still has not arrived (apparently the shipment is caught up in customs). When I found the packing slip my emotions were mixed: disappointment that my sister had not selected the wrong shipping address for my niece’s hoverboard and total amazement at the gift that had been sent to me. The slip did not say who the gift was from but I knew who to call first, my friend Sam. When I asked Sam if she had sent a package from Amazon to my house she replied, “I didn’t, Santa did.” And she added how she read my blog and it was about time I had one referring to the cobalt blue KitchenAid stand mixer she and Santa sent me. And, making sure I knew not to go out and try to buy her a present, she added all I want is some of your lemon cookies. If you and I were having coffee right now … I would tell you that now that January is here I’m busy trying to create an editorial calendar. How do you keep your blogging schedule organized. Happy New Year! I love that you got the best Christmas gift. Did you make the lemon cookies yet? Yeah, did you make those cookies yet, lol…. Santa’s waiting! Thanks, Tikeetha. Happy New Year to you as well. I have not seen Santa or Sam yet, hoping that it will be soon. I will write a post about it for sure. That gift is the sweetest! I love surprises like that. What a wonderful friend. 🙂 Happy New Year! Happy New Year! She totally surprised me and is a blessing to everyone in her life. The house always looks a little sad after the twinkle of the tree and lights are gone. Happy New Year! What a great gift! You will love that thing and keep thanking her for years and years (my Kitchenaid is at least 24 years old and still going strong!) Our tree is still in its full glory for the Epiphany. Who knew I was fulfilling a Christmas tradition?! It’s easy to keep up because it’s artificial so no dropped needles, and besides, I love the sparkling lights on these dark early January evenings. But today is the last day. The bins are sitting there waiting for everything to be put away at last. I’m sure I’m going to love it. I bake a ton so it will definitely be put to good use. I know some people store them but I think it will be getting a spot on my counter. I normally put up a real tree but have put up an artificial tree the last two years and must say I don’t miss the needles in the crevices of my hardwood floors. Happy New Year! It is alway great to receive a surprise gift. The other should be arriving soon. That would be quite the surprise gift. I anxiously await its arrival. Happy New Year!